Calling all young artists, sculptors, crafters. 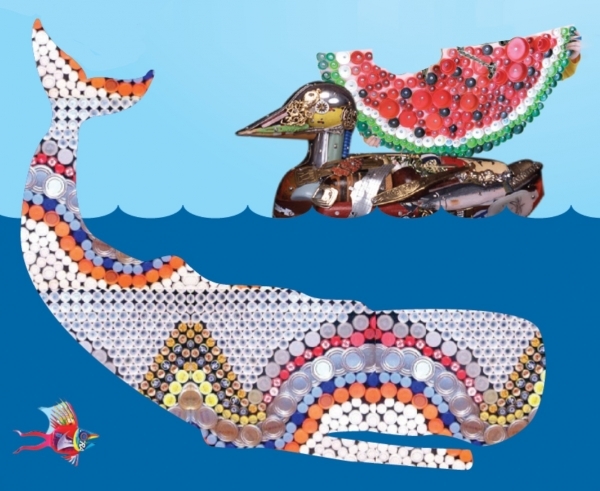 Be inspired & imaginitive, create something beautiful out of junk found along our canals, streams and beaches. Let’s keep our waterways clean and healthy. Entries will be judged on the idea or concept, how well it gets made and finished, and/or its usefulness. Think 3D collages, sculptures, musical instruments, accessories, household items, anything you can imagine. Every entrant will receive a certificate. The three best entries in each category will be awarded with WasteWise Merit Certificates. All merit entries and runners-up will receive prizes. Merit entries will go into the judging for the overall category winners at the African Marine Debris Summit at Kirstenbosch on 8 June. Entries must be made out of materials found along streets, waterways or canals and on the seashore. Be sure to not to pick up anything that looks unhealthy. Walking along the high-tide line at the beach is a good way of finding bits and pieces to make your artifacts out of. The sea air also gives you lots of inspiration! Entries delivered to: Cape Town Civic Centre, Podium area, Mon 3rd or Tues 4th June, 11am – 3pm. Entries may consist of teams of two. Merit entry awardees should be present at the Marine Debris Summit at Kirstenbosch on 8 June. Register by contacting Rodney Leak, WasteWise Schools Co-ordinator on 082 408 8259 or email: leakgr@iafrica.com. Educators: this activity fits into CAPS: creative arts, visual arts, technology streams.